Thank you for all your feedback! We have improved the overall gameplay and fixed several bugs from your suggestions.. . Be sure to update to the current version of Good Pizza, Great Pizza for the newest content. Ever wanted to know what it feels like to run your own Pizza shop? Now you can with TapBlaze’s newest game, Good Pizza, Great Pizza! Do your best to fulfill pizza orders from customers while making enough money to keep your shop open. Upgrade your shop with new toppings and equipment to compe... see more Ever wanted to know what it feels like to run your own Pizza shop? Now you can with TapBlaze’s newest game, Good Pizza, Great Pizza! 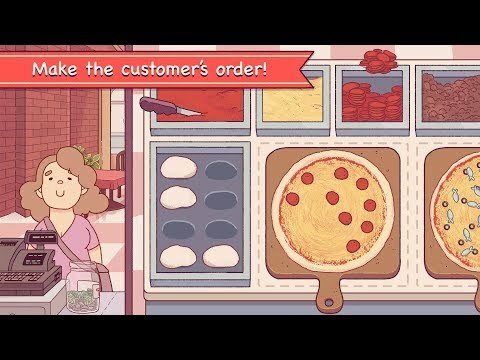 Do your best to fulfill pizza orders from customers while making enough money to keep your shop open. Upgrade your shop with new toppings and equipment to compete against your pizza rival, Alicante!